Iván is a Lead Architect in the Services Business Unit of NNG. He started his career as teacher, so he enjoys sharing information in special ways. 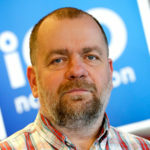 At NNG, he is responsible for „connected services” and „update solutions” system architecture, which are areas he’s been working on since 2007.